The 2018 Northwestern baseball team lines up at the start of a game. The team has struggled this season, but numerous alumni see big things in its future. 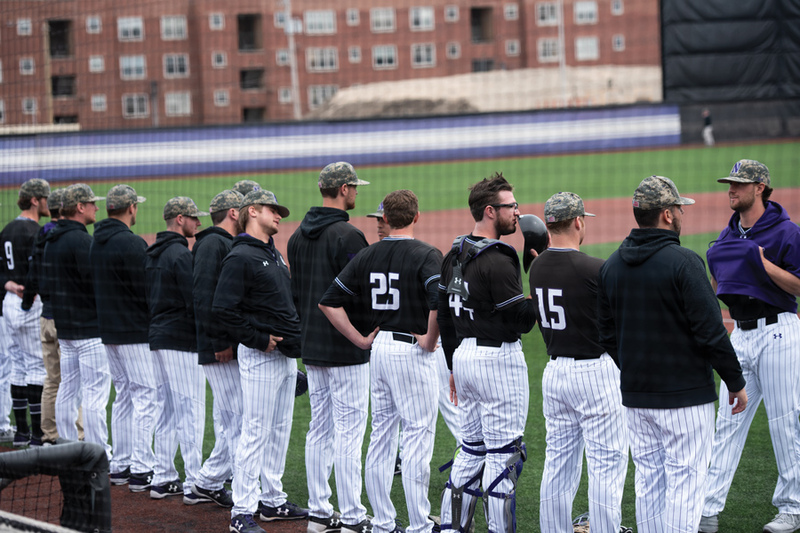 This article is a sidebar to The Daily’s feature on the Wellman era of Northwestern baseball, which brought unprecedented perennial success for the first and only time in its history during the mid-1980s. One has to look closely to find much tribute to legendary 1980s coach Ron Wellman at Northwestern today. Only a small sign along the Miller Park third base-side walkway — opposite the Ashland Avenue main entrance — that reads “Wellman Way” truly visibly does so. But it is hardly surprising that the program has done little to commemorate its history: Since 1892, the Cats have only 34 winning seasons to their name. Their most recent one was 18 years ago, in 2000. Still relatively new coach Spencer Allen nearly steered the team to its first NCAA Tournament since 1957 last spring, guiding a torrid finish to the regular season and dramatic run through the Big Ten Tournament that fell just one game shy of a title. But this year’s team (14-28, 4-17 Big Ten) has regressed back to the depths of the conference. Nevertheless, numerous alumni of the dominant Wellman teams, including Wellman himself, said they feel the most optimistic they ever have that NU can return to its brief former heights. “(Allen is) energetic and recruits very well, he’s organized in his practices and has a very high level of expectation of his players, so he has all of the characteristics that would lead one to believe that he is going to be successful,” Wellman said. Under former head coach Paul Stevens, who left following the 2015 season after 28 years at the helm, the Cats suffered from the poor condition of Miller Park and what Eric Mogentale (McCormick ’84) described as a lack of commitment from the athletic department to baseball program — “Paul had one arm and one leg tied behind his back,” Mogentale said. Those days are clearly gone now, particularly because of 2014 and 2015 renovations to the stadium. NU is now just waiting on the wins. But the Cats’ program is still challenged by the inescapable realities of the university’s tough academic admission standards and high tuition, Wellman said, relating it to his current situation as athletic director at Wake Forest. Baseball teams are limited by the NCAA to the equivalent of just 11.7 total scholarships to divide among as many as 27 partial scholarship-receiving players. That makes attending a school like NU much more expensive than a state school — a recruiting hurdle not faced by the football or basketball teams, which can award universal full scholarships.